OJINAGA, Chihuahua–It’s not something you see every day; a member of the United States Congress enters Mexico on the border and not by flying to Mexico City and back to Washington, DC. Congressional Representative Will Hurd (R-Texas) is also a member of the House Committee on Homeland Security. In the last 18 months, there have been less than a dozen reported murders in Ojinaga, a town of 30000 people. Hurd wants to leverage his connections at the State Dept that he says were forged when he was a CIA agent. He wants the State Dept to reconsider its recent warning concerng intraveling here. “My basic back-of-the-envelope math is that Ojinaga is pretty safe,” he continued. Ojinaga matters because it’s a principal entry point for Mexican beef used by the US fast food industry. Helping to move that Mexican livestock into the US, the USDA has reversed what it said was a security-based decision banning its inspectors from checking US-bound livestock in Ojinaga. That decision is helping to move that Mexican livestock into the US faster and at lower cost. Mexico’s President Enrique Peña Nieto has unveiled plans to create a manufacturing and logistics hub here to serve northern Mexico. That in turn matters for US oil and gas companies looking to use Ojinaga as a base to work in Mexico’s recently-opened domestic energy market. 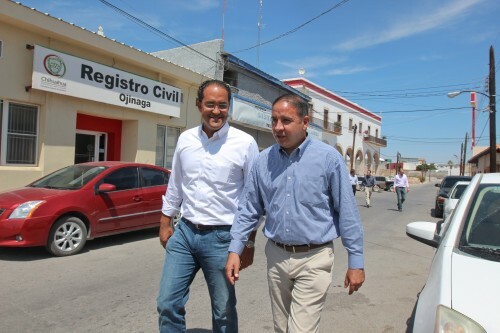 Ojinaga Mayor Miguel Carreón is a member of Mexico’s ruling party, the PRI. He helped Peña Nieto craft his economic stimulus plan for northern Mexico. Carreón concedes that Chihuahua is a violent state. But citing statistics, he says his town is not and that the state as a whole is seeing a reduction in crime. “Last month across the state, we had the lowest number of serious crimes like murder in several years,’ Carreón said, implying that the State Dept right not be aware of that. However, many Mexicans don’t believe major crime is going down. There’s conflict over the definition of organized crime-related killings. And even Mexico’s federal government says that organized kidnapping is still an ugly, major, persistent problem. Many Mexicans will tell visitors that the threat of kidnapping is a serious concern in parts of Mexico, including other parts of Chihuahua State. That said, Carreón and Congressman Hurd agreed to work to change Washington’s view of Ojinaga. But both men concluded that that change is never quick. “Washington, DC doesn’t move at the speed of light, which is unfortunate,” Hurd told Carreón. Carreón said,”I understand what you saying,” concluding with the notion that the same is often true in Mexican politics. “What you need in San Diego is very different than what you need in Presidio,” Hurd said explaining that there is room for nuance in border security policy in certain areas. The State Dept rejects any notion that Ojinaga is safe, which paves the way for some interesting conversations when Congressman Hurd returns to DC. This entry was posted in KRTS News and tagged hurd, mexico violence, Ojinaga, state dept, travel advisory, Travel Warning. Bookmark the permalink.